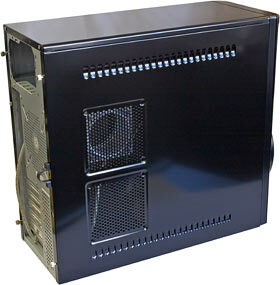 The (wait for it) Genteelord International Limited iCute 0408 SL is a popular PC case. Its name aside, it's got a winning combination of low price, reasonable features, and a completely stupid giant turbine thing on the front that doesn't actually do anything except spin in the breeze of the real fan behind it. But which looks totally awesome, dude. Regrettably, though, you can't buy the 0408 any more. But that's fine, because now you can buy the 0508. There's a certain family resemblance. Like the 408, the 508 is actually a Casepower product, but it's sold under the cheap-and-cheerful GTR banner here in Australia. Shoppers elsewhere in the world can expect to find the same case under yet another brand. If it looks the same, assume that it is the same. The 508 and the 408 are the same size. 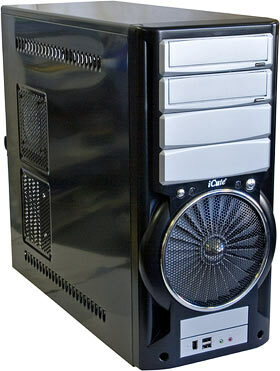 They're both standard midi-towers, accepting ATX and smaller (MicroATX, FlexATX) motherboards. The 408's a bit deeper, but only because its front panel sticks out. The actual metalwork underneath is very similar. The 508, however, is significantly cheaper than the 408 was when I reviewed it. Here in Australia, Aus PC Market are selling the 508 for only $AU93.50 including Sydney metropolitan delivery (delivery elsewhere in the country costs a more). As with the 408, that price doesn't include a power supply, but cheap cases that come with PSUs usually come with pretty darn dodgy PSUs, so that's a feature, not a bug, if you ask me. The 408 hid its front drive bays and front panel ports under a door; the 508 puts all buttons and switches out in the open. You get the same two front USB ports, one front FireWire port and couple of audio connectors. As before, your ability to actually use all of them depends on your motherboard connectors, but the USB ports at least should work with pretty much any modern motherboard. 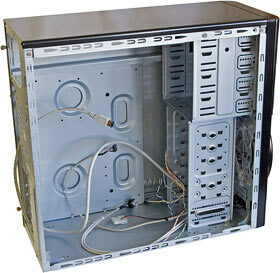 If you like, you can remove the front ports entirely and replace them with a 3.5 inch drive, because the port panel covers a drive bay inside the case. Since there's another 3.5 inch bay right above the port assembly, though, there's not a lot of point to doing this. Still, if you're installing an unusual complement of drives, or putting fan controllers or extra vents or whatever in the drive bays, this extra flexibility is nice to have. The 0508 also has a couple of "stealth" 5.25 inch bays, with front panels that sit over the boring beige front panel that your optical drives probably have, and make them look... somewhat cooler. If the door and/or button of the drive you want to use doesn't line up properly, you can as usual just toss the extra front panels and install your drives as normal. And then, there's that giant fan thing. As with the 408, there's a low power, low noise, blue-LED-lit 120mm fan behind the "turbine", and it's the airflow from that fan that makes the more impressive looking blades spin. The turbine has no practical function at all, and probably can't be coaxed into having a practical function either. But, if you ask me, the 508's turbine looks even neater than the 408's. It's bigger, it's got a shiny boss in the middle, and it's close to its grille and so easier to see. At the back, there's an exhaust fan mount - but the 508 doesn't come with a fan actually installed there. The 408 did. 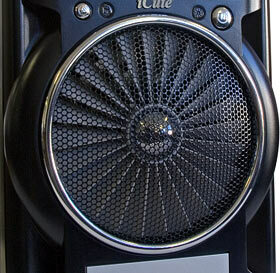 No matter; the 508's quite a bit cheaper, so you can just buy a fan to put there and be no worse off. On the down side, the 508's rear fan grille is boring stamped metal that doesn't let much air through as a wire grille, unless you take to it with a power tool. 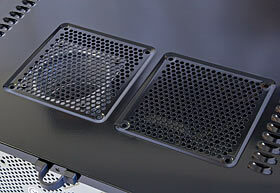 On the up side, there are mounting holes there for 120mm, 92mm and 80mm fans. Oh, and when you've finished discussing that, note the loopback cable that goes to the front FireWire socket. Plus: This means you'll easily be able to use the front FireWire port on all sorts of modern motherboards, since FireWire 400 sockets are quite standard equipment these days. Minus: You're only moving a rear port to the front, not using a motherboard header to create a port you didn't previously have. More observant readers may also notice that, unlike the 408 I reviewed, this 508 does not have a side window. You can have one if you want, though. Of the various 0508, uh, variants on show here, Aus PC Market stock the black and silver style, with or without the window. The windowed 0508 costs $AU99 delivered within Sydney; that's only $AU5.50 more than this version. 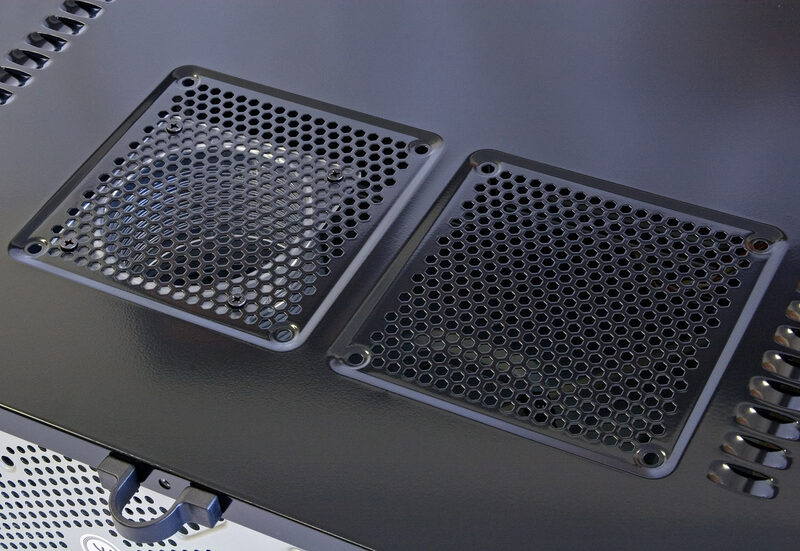 The 408 had a side vent and a little doodad to help guide air to or from the CPU cooler (depending on which way your CPU cooler fan blows). 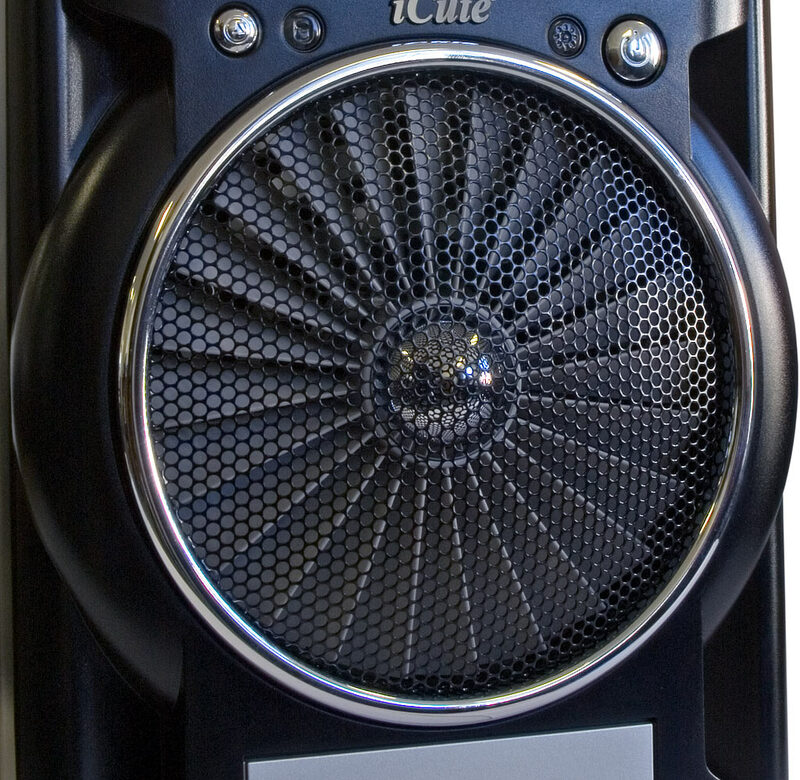 The 508 has two side vents, each of which can accept the air-guide in various positions, or another optional fan, up to 120mm in diameter. So one way or another, this case lets you shift a whole lot of molecules in the vicinity of your CPU. Use the obligatory-these-days thumbscrews to open it up (the 508 has a finger-loop handle on the side panel to make opening it easy; the 408 had a bigger shiny metal handle), and there's the lack of thrilling features you expect at this price point. 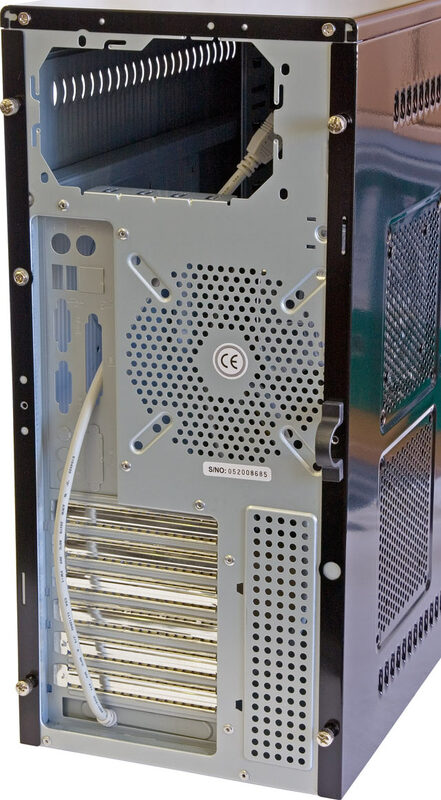 It's all plain mild steel (without the true sign of a bargain basement case, razor-sharp edges everywhere), there's no removable motherboard tray, and there are no removable drive bays. 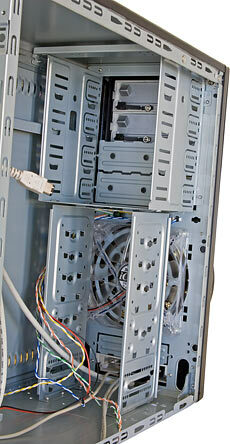 There are little header plugs for the front ports, a passthrough "Molex" plug for the front fan, and that's about it. The 508's bay count is four 5.25 inch - all "external", meaning accessible from outside, of course - six "internal" 3.5 inch, and two external 3.5 inch, if you count the one with the front port panel in it. The 408's bay count was the same, but both of the external 3.5 bays were accessible from the factory, because the front ports were elsewhere. The GTR page for the 508 says it's got only five internal 3.5 inch bays; I presume that's because they got confused by the front port thing. You shouldn't expect to use the whole bay count of a case like this for drives, anyway. It'll be fine if you set your PC up so that there's an empty bay on at least one side of every drive, but if you stack drives cheek-by-jowl all the way up the front of the case, they may not all get enough airflow to stay cool if they're all spun up at once. The ones right behind the front fan should be OK, provided you don't go completely mad and install 10,000RPM or faster expenso-drives in your cheap case, but you should be careful about qhat you put in the other 3.5 inch bays if you don't intend to run the computer in a refrigerator. 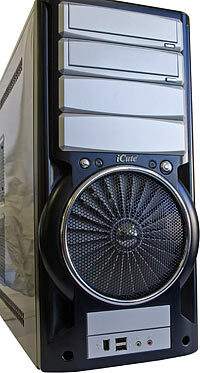 The GTR iCute 0508 Et Cetera is a cheap PC case, but it is not a nasty PC case. There are no luxury features inside, but you don't need a rubber mallet to open it and you don't need bricklayer's gloves to work on it safely. And even if you buy the windowed version, and a rear fan to go with it, you'll still find yourself paying quite a bit less than you would for the non-windowed version of the 0408. The goofy turbine's better in this version, too. The old 0408 had a great big Roman nose of a front panel, sticking out well in front of the actual chassis like the Mile O' Fibreglass that sprouted out of various muscle cars a few decades back. The 0508 doesn't bother with such a prominent cowling and door, and is all the better for it, if you ask me. I didn't have the chance to check out the 0408 and 0508 next to each other, but it also seems to me that the bearing that the 0508's turbine spins on is rather slicker than the one in the 0408. Or maybe the 0508's turbine just spins longer because it's bigger and heavier than the 0408's. Either way, that means the 0508 turbine will impede air flow less than the 0408 one; if the bearing genuinely is better, then it'll let even more air through. The bearing also ought to last a very long time, since the turbine never actually spins very fast - not with the standard front fan, anyway. 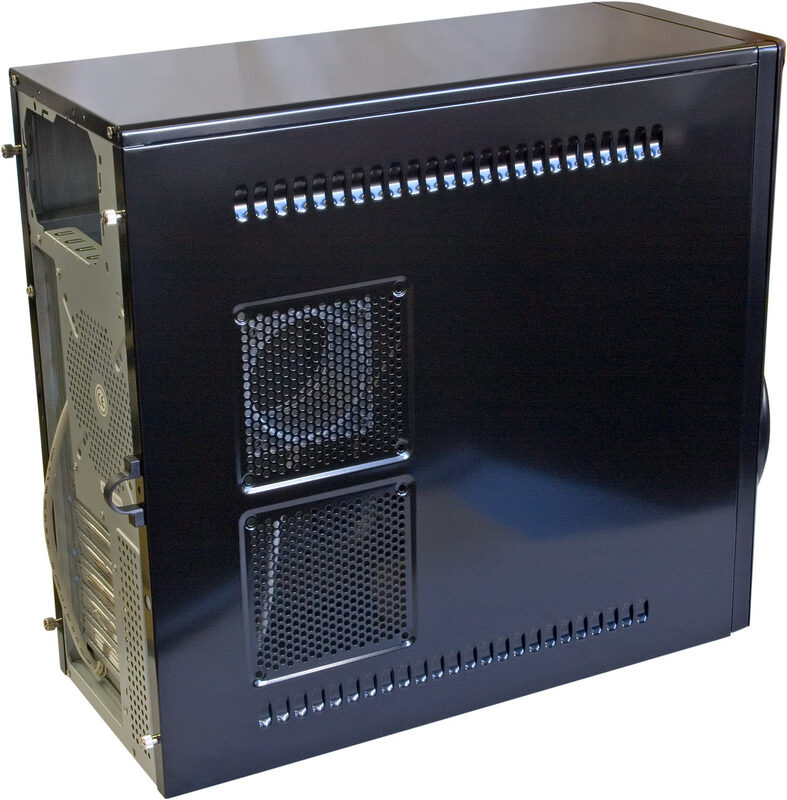 So, if you missed your chance to buy a silly-but-sensible computer case when the 0408 was available, go ahead and buy an 0508 now. It's better, and cheaper. Australian shoppers can buy the iCute 0508 from Aus PC Market. click here for the marginally more expensive version with the see-through side.